The concept of Bubali Bliss Boutique Apartments in Aruba is based on three focus points: excellent location, best value for money and trendy, boutique-style design. Bubali Bliss Apartments is ideally located withing walking distance from Aruba's famous Eagle Beach, shops, restaurants and supermarkets. These trendy, boutique-style apartments in Aruba are comfortable, spacious, modern and offer an incredible value for money. Bubali Bliss Apartments is especially recommended for vacationers and business travelers that expect modern comforts and stylish accommodations, yet are less depending on full service and are pirce-conscious. The Bubali Bliss concept is also designed to improve travelers' independence and flexibility. Check-in can be done at all times, based on a self check-in system with a keyless access code. For basic concierge services, daily questions and regular check-in/check-out procedures, a manned Front Desk is open daily from 9-11 am from Monday - Saturday. Bubali Bliss Apartments in Aruba is housed on a unique location with a rich history. Once a prestigious Aruban villa, Bubali Bliss combines charm, grandeur and typical Aruban architecture with a unique retro-Caribbean style inside all 10 spacious, trendy studios apartmens combining Caribbean charm and typical Aruban architecture with a modern, boutique-style design. How far of a walk is Eagle Beach? Eagle Beach is at a walking distance of 650m. Cross the street in front of the Superfood (supermarket) and follow your way passed Tropicana / La Cabana on the leftside and Amsterdam Manor on the right hand side. Is there Wifi on property? Throughout the property free wifi is offered. By email and in your welcome letter the network name and password is provided. Can we park our car near your property? At Bubali Bliss Studios we have free parking for our guests. The parking is under camera surveillance and right in front of the property. Do you offer manned front desk? Our front desk is open daily from Monday thru Saturday between 9am and 11am to attend basic needs, daily questions and regular check-in/check-out processes. How does the self check-in process work? No waiting lines to check in, please check the self check-in page here. How far is the nearest supermarket? Aruba's best supermarket, named SUPERFOOD, is just steps from Bubali Bliss Studios. A 2min walk takes you to the biggest supermarket with an excellent in-house butcher, fresh fish store, restaurant bistrot, pharmacy, interior decoration store, household store, toys shop and much more. Do you offer airport shuttle? Air-port shuttle is not offered. Upon arrival at the airport, you will find taxis lined up. All taxis are government regulated and standard fee from the airport to Bubali Bliss is $22 including 1 suitcase and 1 hand luggage (max. 5pers for 1 taxi). For every extra suitcase $2,- is added and on Sundays and daily from 11pm till 7am a $3,- nightfee is added. Where is the busstop to go to Oranjestad or Palmbeach? Public transport on Aruba is well organised. 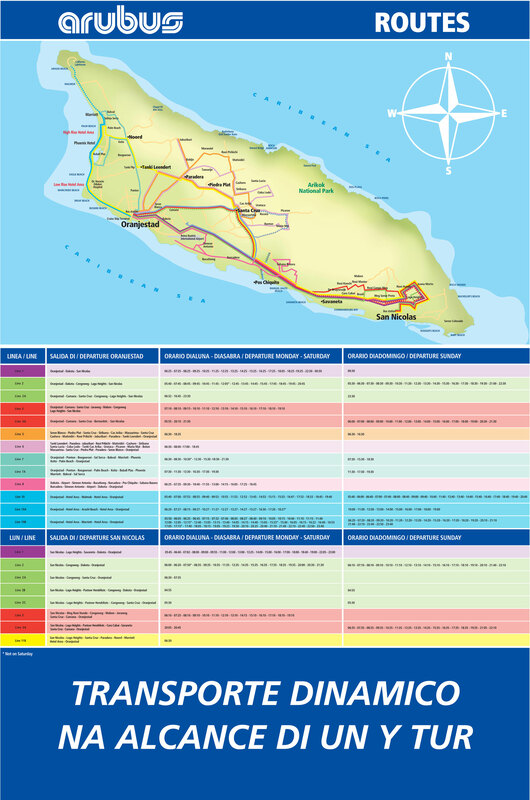 Arubus is the main carrier and you will find the closest stop on Eagle Beach for line 10. More information on the bus-system's routes can be found here and here. Are the kitchens fully furnished? Our kitchen is fully furnished which means foreseen of pots, pans, plates, knives, glasses, cups, a coffe machine, microwave, 4 pit gas stove and kitchen utensils. Coffee, coffee filters and dishwash soap is not provided. Is tap water in Aruba drinkable? Yes Aruba has drinkable water from the tap. It is very tasty as well. How can we arrange a taxi? Make sure to visit us between 9am and 11am (except for Sundays), when management is on propery, and we will gladly arrange a taxi. If management is not on property, walk to the entrance of the Superfood and most likely you will find a taxi waiting there (between 8am and 8pm, daily except on Sunday's). Do you provide towels and beach towels? Yes beach towels are provided. Upon arrival you will find 2 beachtowels inside your Studio or Apartment. The following bath towels are provided as well: 2 bath towels, 2 face towels, 2 wascloths, a kitchen towel and a bath mat. Please note that the loss of towels corresponds to a $25 USD charge on your credit card. How often are towels and beach towels replaced? Basic cleaning and replacing of towels takes place every third day of your stay. We don't have a washing machine on property. Laundry services can be found around the corner from Bubali Bliss Studios. How big is the pool and does the sundeck offer shade? The pool measures 4x7 meters and is surrounded by a pooldeck. The pooldeck connects to Bubali Bliss's outside common area with hammocks and lounge set. This area is covered by a "gazebo" which offers plenty of shade to relax and enjoy the Aruban climate and vacation atmosphere. Is Bubali Bliss Studios a child friendly property? Childrens are welcome and till the age of 2 years they can stay for free when using existing beddings. Besides the pool we don't have other facilities to cater for children. Bubali Bliss Apartmens is a self check-in property with keycode entry locks, offering the ultimate privacy, flexibility and convenience. After charging the total balance of your stay the following information regarding self check-in is sent by email: unit number, private access code to enter your unit, code of the main gate, a floorplan and clear directions to Bubali Bliss Apartments. Upon check in your credit card will be authorized for a USD100.- charge for incidentals. The surcharge for late check-out (the latest till 5PM) is USD60.-. Depending on availability on your departure date, late check-outs may not be available. Eagle Beach Aruba, on a short walking distance from Bubali Bliss is the most breathtaking beach on the island. Eagle Beach Aruba is consistently voted amongst the top 10 beaches of the world! With its sugary white sand and crystal clear turquoise water, it is truly a must see for anyone vacationing on the island of Aruba. Eagle Beach Aruba offers an extensive variety of water sports opportunities, beach bars, public restroom facilities, free wifi and sufficient parking. At a fee, lounge chairs and umbrellas can be rented by the hour, or per day. Fresh beachtowels are provided daily at Bubali Bliss for your convenience. Watersports offer the opportunity to be active and healthy during your holiday whilst experiencing a thrill most can’t obtain back home. Just minutes away from Bubali Bliss at Eagle beach, you will find mile long stretches of beach presenting a vast collection of watersports. There no better place to explore all the ocean has to offer, than on Aruba’s breath-taking beaches. Red Sail Sports Aruba is the most complete diving and watersports center on the Island and offers everything from scuba diving, catamaran tours and many other water activities on Aruba with expert instructors at three full service dive and watersports centers across the Island, Hyatt Regency Aruba Resort & Casino, the second at the Aruba Marriott Resort, and the third at the Renaissance Aruba Beach Resort. Eagle beach offers the once in a life time opportunity to learn how to wake board or water ski, from skilled instructors and what better place to start then on one of the worlds most beautiful beaches! Eagle beach, located right across from Bubali Bliss affordable apartments, offers numerous opportunities to rent jet skis. Jet skiing is an exciting way to experience the thrill of speeding across the intense blue Caribbean sea on your own terms. The various watersports huts across the beach offer single and double jet skis. For those who prefer a more relaxing way to experience the waters of the Caribbean, the beach also offers kayak and paddle board rental opportunities. Experience the thrill of a life time, drifting numerous feet over the intense blue waters of the Caribbean, with the warm wind blowing thru your hair, and having the greatest view over the white coastline of one of our most amazing beaches, this is a must do for all dare-devils out there. For the ocean lovers out there, Eagle beach offers a variety of snorkeling and diving opportunities. You will be picked up by boat and taken straight to Aruba’s most prestige diving locations, the Antilla shipwreck, the Barcadera reef, the sunken planes at the Sonesta reef or the Baby beach reef. The foremost snorkeling destinations are just minutes away from Bubali Bliss. Eagle beach offers everything from romantic sunset catamaran tours to sailing and diving tours as well as fishing and the glass bottom boat tours. Ideally located across from Bubali Bliss Apartments you will find Superfood Plaza, offering Aruba's most popular Superfood Supermarket, along with a choie of smaller shops, a restaurant, coffee bar, drug store, liquor store, fresh fish store, and more. On a 5-minutes drive from Bubali Bliss you have access to the Palm Beach area which features two shopping malls, cinema theaters, an array of shops, fashion stores, top notch restaurants as well as plenty of opportunities to relax and have a drink. Bubali Bliss Apartments is a ten-minutes drive from Aruba's capital, Oranjestad, where you will find the Renaissance mall, which is Aruba's most deluxe and prestigious shopping mall. Here you will also find more local shopping streets, two additional shopping malls, local eateries, casinos and cinemas. Most stores in Oranjestad are open from 9 am. - 6 pm., Monday –Saturday. The stores at the Palm Plaza Mall and Paseo Herencia Mall are open daily from 5pm – 10pm. At Cosesha, in downtown Oranjestad behind the Renaissance Hotel, you will find local arts and crafts, certified by Aruba’s government. If you want to shop for souvenirs, consider buying local crafts from Aruban artists. Most souvenirs and products offered at flea markets and stores around the Cruise Terminal, are imported and made in Taiwan (and such). ON A SHOPPING SPREE IN ARUBA - HOW TO GET THERE?If you don’t want to rent a car, you can either call a taxi or take the public bus. The bus stop is located at a 10 minutes walk from Bubali Bliss and takes you to Oranjestad (south-bound), as well as the Palm Beach area (north-bound).